U.S.S. Albion is the ninth member of the Excelsior class. Launched on Stardate 10121.5, she is the latest operational addition to Starfleet's newest starship class. The Excelsior class is the fastest, most powerful and the most versatile in the Starfleet. She continues in the tradition of exploration and discovery established by the Constitution class vessels of thirty years ago, following in the footsteps of Cochrane's first warp drive ship, the Phoenix. Albion is 467 metres long, has a beam of 185 metres, a height of 100 metres and weighs 2 350 000 tonnes. The basic hull structure is fabricated from tritanium/duranium alloys. Albion was built at Starfleet's Utopia Planitia Orbital Yards on Stardate 10121.5 (Earth year 2295), although she was completed as early as Stardate 9874.5 , she was used as a testbed for the technologies incorporated into the Enterprise-B in order to bring about the 17th generation starship. 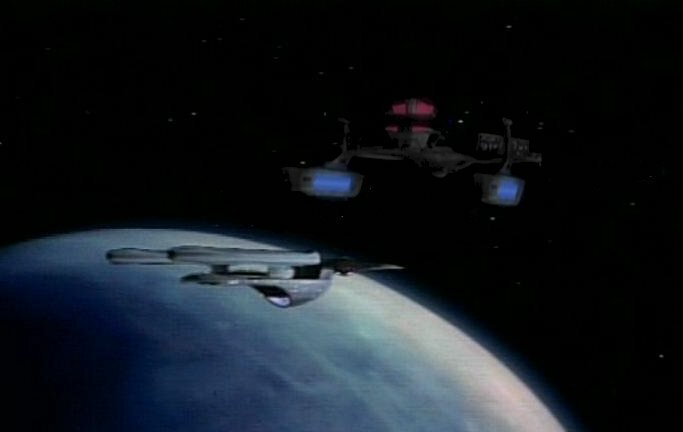 Twenty-seven Excelsior class starships have been built to date  by Starfleet. These are comprised of mostly variant one Excelsiors and one variant two. Excelsior was the first variant one, launched in 2285 as N.X. 2000. Enterprise was the first variant two, being launched on Stardate 9715. Albion is the ninth operational ship in the Excelsior class. Albion is the most advanced ship in the fleet, utilising technology tested in Excelsior and upgraded by Enterprise 1701-B. The Excelsior class U.S.S. Albion supports a compliment of 450 crew members, and 52 mission specialists that have joined the ship for specific projects, this brings the ship's entire compliment to 502. The ship is capable of independant operation for about three years without refueling. The primary mission of the Albion is exploration and research in the Beta Quadrant, being superbly equipped for both. For those occasions when a show of force is unavoidable, the ship is equipped with an impressive array of defensive weaponry. Now in her fourth five-year deep space mission, U.S.S. Albion is commanded by Captain Stephen Ward. Albion has been assigned to the Beta Quadrant to explore, chart and scrutinise the worlds that, up until recently, existed beyond the Neutral Zone. U.S.S. Albion is to explore these worlds around the border that have not been charted more than the skimming-over from previous probes and smaller vessels. Albion is the command flagship of the Ninth Fleet and is at the full disposal of Fleet Admiral Matthew Tovey, should the need arise for a platform for exploration, diplomacy or defence. Albion represents the cutting edge of operational in-the-field Federation technology and thus is a spectacular ambassador to the Federation's more than one hundred and fifty-one years of existence. 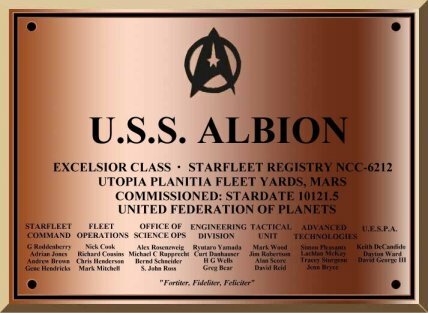 The Albion is on a five year commission from 2309 – 14, with a refit due in late 2314- early 2315. The mission takes place along the ISC Armistice Line and shadows the Saratoga ’s pathfinding mission to contact the ISC ready for the Sheffield. The Albion is also the forward-deployed flagship for the Armistice Line with all of its scientific technology acting in concert with the Ark Royal, Ulysses and Komsomolsk class capital ships out there. The Albion has also performed a flag-waving mission to the far side of Klingon space, observing the Holy Order of the Kinshaya and liaising with the Fearless on her mission into Lyran space. 6	Sickbay, Transporter rooms, Crew Quarters, Social Sciences Department. 8	Shuttlebay Control, Main Computer, The 'Old Grey Ghost' Lounge, Ship's Galley. 18	Aft Shuttle Bay, Deuterium Tank.